Jo is mum to Zach and Imogene and married to the love of her life. She left her job to take care of the children and for the longest of time didn't realise she wasn't feeling entirely fulfilled in this situation. That is, until one night she has a dream in which she owns a shop. And not just any shop, no this is a children's clothing shop that particularly tailors to little boys, like her own, set in a child-proof and entertaining environment for the children to make the shopping experience as stress-free as possible for the parents. The dream sparks Jo's imagination and her husband Lee's creativity and it doesn't take long for them to realise that what they have is something truly original, different and... it might actually work! With Lee's help Jo sets the wheels into motion to make the shop a reality and the two quickly find a wealth of equally creative, caring and interesting people around them that contribute to making Jo's dream a reality. First there is Holly. She has spent the past ten years of her life in South Africa but returns to the cold British shores and moves back into her parents' house at age 30 after her now ex-boyfriend ruins both her life and clothing business, which she set up from scratch herself, leaving her with not even a penny to her name. Mel is a single mum struggling to come to terms with the changing relationship between herself and her daughter. Serena used to share everything with her mother, but in recent months she has become much more introvert and secretive and when Mel finds a piece of card torn from a Rizla cigarette paper package in Serena's room she starts to genuinely worry about what crowd Serena is moving in nowadays and the danger her teenage daughter may have found herself in. Jo, Holly and Mel are all incredibly strong and inspirational women to read about. And even though they span different generations I found something familiar and interesting within each of their stories that made me connect to them as a person I wanted to know more about and rooted for within the novel. And despite its title, Wonder Women does not only tell the story of some true wonder women, but also a few wonder men. There is Jo's husband Lee of course, and also Richard who becomes interested in the shop and wants to buy a share into it. And let's not forget Daniel and Chris, two teenage boys who have set up their own t-shirt printing business and are of great help to the women central to the story. Despite their realistic flaws the main characters within the novel are without exception admirable people. They manage to take care of their children, set up a business and be an inspiration to those around them - all at the same time! 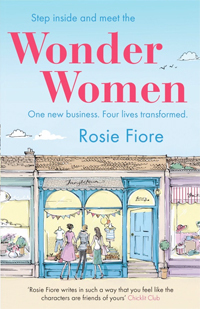 They were a delight to read about, and I hope we haven't heard the last of them and author Rosie Fiore will consider revisiting the characters in a future novel. Once you've finished reading Wonder Woman also make sure to check out The Mummyfesto by Linda Green [read my review here], another excellent novel focusing on strong and resourceful women making a positive change within their community. Many thanks to Quercus for providing me with a copy of the novel in exchange for an honest review.